Will the plastic bag charge in England make any difference? From 5th October, if you go into a supermarket in England and fill up your trolley with the weekly shop, you better hope you brought your own bags with you. From now on, any shop in England with over 250 employees will have to comply with a new law to charge 5p for every plastic bag used by customers. The scheme has already been underway in Wales, Scotland and Ireland, and it is hoped that the law will see an 80% reduction in plastic bag purchase in England. The aim is to reduce the use of plastic bags, which are littering our countryside and oceans and harming the animals that often become entangled in them. The magnitude of the paper bag problem can be better understood when one takes a look at the staggering statistics of how many bags are produced each year, and how few bags are actually recycled. It has been estimated that over one trillion plastic bags are used worldwide each year and .5% to 3% of all bags winds up recycled. 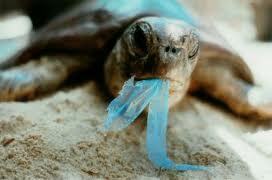 In 2006, the United Nations found that each square mile of the ocean has 46,000 pieces of plastic in it. But is this small charge enough? Will people still use them? And what can we do about the plastic bags already in existence, which are taking hundreds and hundreds of years to degrade.. While a decrease in production of plastic bags will undoubtedly be beneficial, it doesn’t go far enough in solving the huge problems caused by all plastics in the environment. I’m looking at you, plastic bottles. Plastic bottle tops are currently not recyclable, and as with plastic bags they often end up at the bottom of the ocean, and in the stomachs of a variety of animal species that mistake them for food. One albatross that was recently found dead on a Hawaiian island had a stomach full of 119 bottle caps. Next step is to ban plastic bottles. Read the rest of the One Green Planet article to understand the health impacts of plastic bottles.